The 2015 Aftermath K9 Contest Heats Up! At Aftermath Services, we understand the importance of having a good team and the necessary equipment to support getting the job done right For many law enforcement agencies, funds for safety equipment, uniforms, and investigative supplies can be challenging to obtain. Supportive units such as K9 operations are typically underfunded, if they exist at all. These highly trained teams of dogs and their handlers serve numerous important functions, including search and rescue, evidence location, and suspect apprehension. For these reasons, Aftermath Services decided to sponsor a giveaway that rewarded the men and women of law enforcement for their hard work and dedication, serving the communities where we live and work. Winners of the contest received a $5,000 grant to help fund the purchase and training of a new K9 officer. This was four years ago. Since that time, we have helped several great departments grow and develop their K9 forces. Moreover, the feedback we received has been overwhelmingly supportive, encouraging us to continue the drawing each year. Just last week, we proudly announced the fourth year of the Aftermath K9 Contest, along with some great changes that will allow us to include a wider range of law enforcement agencies. Read on to find out more! One of the biggest changes we’ve made to this year’s contest concerns the voting aspect. Winners in previous years were drawn at random from the total entries received. While anyone in law enforcement was allowed to vote, only one vote person was permitted. This year, we’ve changed all that! Now, not only is the entire community encouraged to vote, but you can vote once a day, and even gain extra votes by including photographs of your office or precinct. 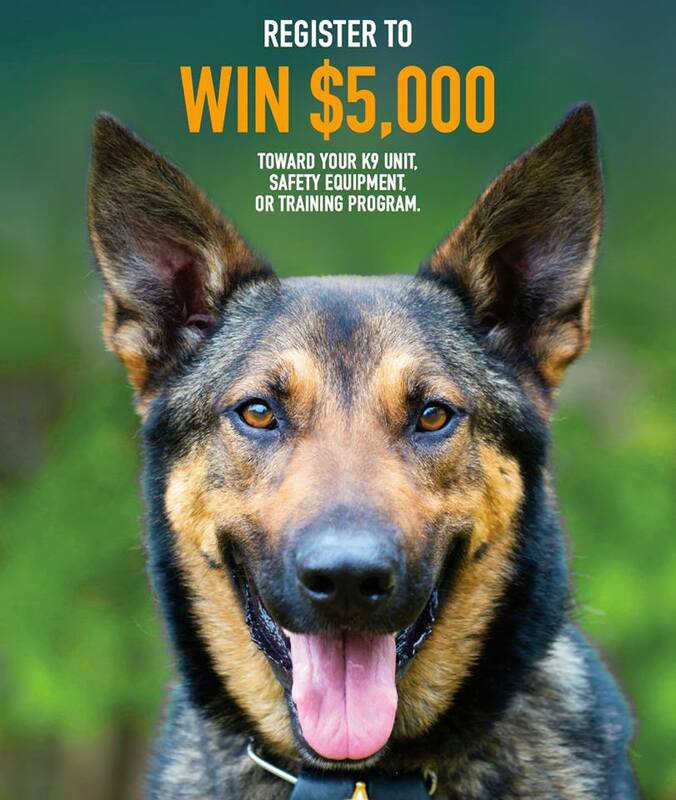 With opening up the contest to involve the community, we’ve also expanded it in another important aspect: while before the funds for the drawing were allocated to the training and purchase of a K9, this year the grant includes other expenses such as safety equipment, additional training, and supplies such as food and veterinary care. This means that departments with existing K9 programs can also enter! 1. Get your whole precinct involved! One method of doing this is to share the voting page link with your whole office, and encouraging them to vote. Take an extra step and reach out to your friends, family, and the community. 2. Speak to local media. Let news websites and local newspapers know about the contest. Ask them to publicize your participation and reach out to the community at large for extra votes. 3. Go viral. Use social media to announce the contest. Share our link on your personal Facebook, Twitter, or other channels. Departments with a social media presence can connect with us on these mediums for extra visibility. 4. Take a picture. To score an extra vote, attach a picture of your K9 team or members of your squad. We’d love to see your faces! 5. Finally, be sure to encourage everyone to stop by the page and vote EVERY DAY! The Aftermath K9 Contest runs from October 1st, 2015 until the 31st of the month. Be sure to get your votes in every day. Once you’ve voted, stay tuned to our blog and watch your email as we update you on the week’s top competitors. For more information on the rules and other details, click here. The winner will be chosen on November 3rd, 2015. As always, Aftermath is pleased and proud to support our men and women in law enforcement. For more information on our services, including biohazard cleanup for jail cells and squad cars, visit our website or call 877-872-4339.